Margaret (‘Pearl’) Dunlevy, physician and epidemiologist, was born Bridget Margaret Mary Dunlevy on 13 August 1909 at Mountcharles, Co. Donegal, the fifth of six children of George Dunlevy, shopkeeper and merchant, and Maggie Dunlevy (née Doherty). After attending the Loreto Convent, St Stephen’s Green, Dublin, and St Louis Convent, Carrickmacross, Co. Monaghan, Dunlevy commenced medical studies at RCSI. Taught by Sir Thomas Myles, she received her licence in 1932, coming first in her class. She then served as house surgeon at the Eye Hospital, Newcastle-upon-Tyne (1932–3), house physician and surgeon at Nuneaton General Hospital (1933), resident surgical officer at Birmingham Children’s Hospital (1933–4), medical officer at Sydenham Children’s Hospital, London (1934), and house surgeon at Standon Hall Orthopaedic Hospital, Staffordshire (1934–5). Dr G Carey, Dr P Dunlevy, Dr E Wallis, Dr B O’Donnell at the AGM of the Irish Society of Medical Officers of Health, 17th May 1975, IMA House’, Medical Times, 23rd May 1975. On graduating first place in the UCD diploma in public health (1936), she was appointed temporary assistant county medical officer of health in Donegal (1936), then assistant medical officer of health in Dublin (1938), and medical officer at Crooksling tuberculosis sanatorium, Co. Dublin. Developing considerable expertise in the treatment and control of childhood TB cases, Dunlevy, with three medical colleagues from Dublin Corporation’s TB service, undertook a six week tour (June–July 1947) of Norway, Denmark (especially the Central Tuberculosis Clinic in Copenhagen) and Sweden to assess the deployment of the BCG vaccine in the region, where childhood TB was rare. By this time Dunlevy had already established (1945) Dublin Corporation’s primary TB clinic at the Carnegie Trust Child Welfare Centre in Lord Edward Street. The clinic aimed to identify and immediately treat children with TB, successfully minimising their admission to sanatoria. Appointed a Dublin Corporation TB officer (1947), Dunlevy managed a mass x-ray (radiography) programme and commenced tuberculin testing to assess TB infection rates and the likely loci of transmission, aiding identification of the source of infection (linked to overcrowded houses). She was appointed assistant medical officer for Dublin city (1948). Such was her reputation for organisational and clinical rigour, Dunlevy was appointed to establish a childhood BCG vaccination scheme in Dublin. Pulmonary TB was then widespread among expectant mothers; the incidence of TB in the city, rising during the wartime emergency, peaked in 1947. Children under five years of age experienced the highest mortality; of the 138 childhood TB deaths in the city in 1947 (81 of which were due to tuberculosis meningitis), 101 were aged five years or less. Emanating from a Medical Research Council of Ireland committee (1946) tasked with assessing TB treatments and the utility of vaccination, the Dublin Corporation BCG vaccination scheme commenced in October 1948. Initially focusing on newborn children of TB-infected parents, the scheme gradually expanded to include all newborn children, student nurses and medical students, and later the staff and students of residential schools. By 1949, with radiological screening rapidly identifying those in need of treatment at St Ultan’s, childhood TB deaths decreased to 46 (one-third of their 1947 total). Dunlevy was a member of the committee (1948) and of the ensuing government-established limited company (Hospital’s Associated Ltd (1949)) that designed and built a TB sanatorium at Ballyowen, Lucan, Co. Dublin, for childhood TB treatment. The scheme was extended to those newborns exposed to TB at the Rotunda (September 1950) and the Coombe (1951) maternity hospitals, and then to all newborns (from 1954). The first such local authority scheme in Ireland or Britain, the Dublin Corporation BCG scheme by 1953 had reduced childhood TB deaths by 82 per cent. With parental consent always being sought, over 85,000 children were vaccinated between October 1948 and October 1958, without a single death from TB among the group. Any childhood deaths from TB in the city, ranging from one to three annually, were among the unvaccinated. The support of James Deeny, the state’s chief medical officer (1944–50), and of Noel Browne, minister for health (1948–51), along with the impact of the newly established (1947) Department of Health, contributed to the success of the Dublin BCG scheme. Furthermore, the deployment of emergent combinations of antibiotics, the impact of mass x-ray programmes, and the notable increase of sanatoria beds through the 1950s all contributed to a further decline in TB infection. Appointed (1949) by Browne to the national BCG committee, which under John Cowell gradually expanded BCG vaccinations nationwide concurrently with the separate Dublin scheme, Dunlevy outlived many of her early collaborators to attend the last meeting of the committee in December 1978. She served effectively as senior assistant chief medical officer in the Dublin Health Authority (1960), which unified all health and public assistance services for Dublin city and county in charge of immunisation services across the city (1960–71). As TB, diphtheria and other infectious diseases gradually receded, from 1965, Dunlevy oversaw a polio vaccination programme in Dublin. She also addressed the epidemiology of rubella (German measles), leading from 1971 a Dublin rubella vaccination scheme for girls aged 12 to 14. Continuing to work closely with the Dublin maternity hospitals, at the end of 1972 she introduced a rubella screening program for those in early pregnancy. Garnering an international reputation, Dunlevy attended conferences in the UK and Europe presenting on her work. She published in the prestigious French journal Revue de la tuberculose (1951) and undertook further postgraduate training in Paris (1954). Focusing on childhood epidemiology, vaccination and public health, her many papers appeared in the British Medical Journal, the Journal of the Medical Association of Éire, the Irish Journal of Medical Science, and the Journal of the Irish Medical Association. She served as deputy chief medical officer in the Eastern Health Board from 1971 until her retirement in September 1976. Dunlevy wrote a regular column for the Irish Medical Times and contributed ‘Medical families in medieval Ireland’ to Doolin and Fitzgerald’s (1952) What’s past is prologue: a retrospect of Irish medicine drawing on her expansive knowledge of the history of medicine in Ireland from ancient times and her own ancestry as a member of a hereditary medical family. 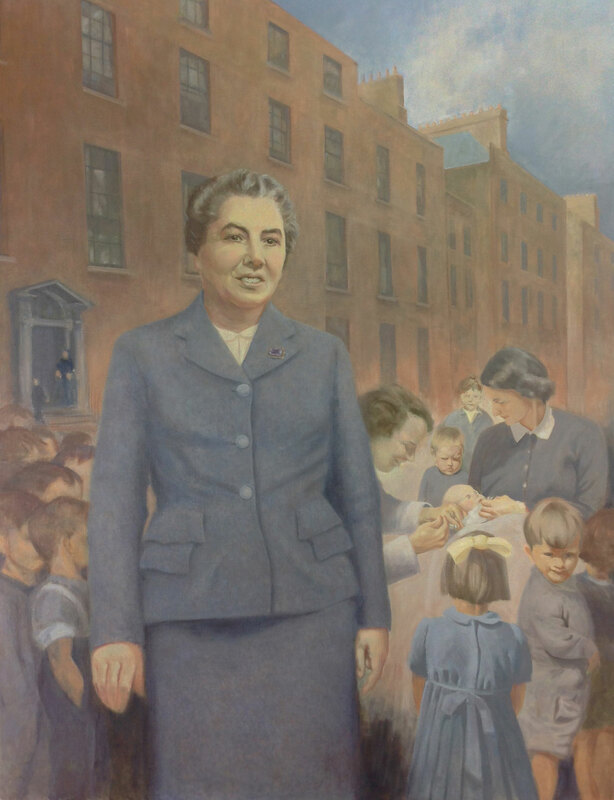 Elected the first woman president (1951–2) of the Biological Society of RCSI, she discussed ‘The prevention of tuberculosis’ in her inaugural address. A long-time examiner for RCSI diploma in child health, president of the Irish Society for Medical Officers of Health, and a committee member of the ‘women’s federation’ of the Irish Medical Association, she was a member (1978) and fellow (1980) of the RCPI, as well as a member of the faculty of community medicine of the RCPI, and a fellow of RAMI. Having been nursed by her long-time companion Kathleen Hughes, Margaret Dunlevy died 3 June 2002 in Dublin, and was buried in Shanganagh cemetery.